The bed. The location was poor and more than 30 minutes from even attraction. I asked for close proximity. The shower had hot water and the towels were clean - common expectations...other than that I was severely disappointed. Room was spacious as was the bathroom. Breakfast was above average for complimentary. Not very much ..., The hotel was in walking distance to the pier. The bed and pillows were very comfortable. We enjoyed the view across the bay to Breezy Point and took a few moments to watch the bird life. Very overpriced for this 2 star max hotel. It's actually I would say, a motel, not hotel and price is overwhelming high for this kind of motel. The allowed us to check in early. Nice location to near by restaurants and bus stop. 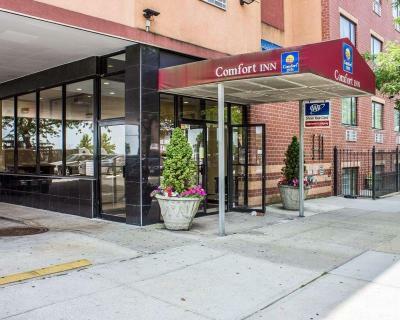 Comfort Inn Brooklyn This rating is a reflection of how the property compares to the industry standard when it comes to price, facilities and services available. It's based on a self-evaluation by the property. Use this rating to help choose your stay! Additional nearby points of interest include: Statue of Liberty, Rockefeller Center, Ellis Island Immigration Museum, Staten Island Ferry, Guggenheim Museum. Your Morning Breakfast is full of hot options, making breakfast at the Comfort Inn the perfect way to start your day. Enjoy our free hot breakfast featuring eggs, meat, yogurt, fresh fruit, cereal and more, including your choice of hot waffle flavors. Guests of this hotel will enjoy fine amenities, such as free local calls, free weekday newspaper and free coffee. Be sure to take advantage of the hotel's fitness center. Business travelers will appreciate access to fax services. The on-site meeting room accommodates up to 20 people for business events. All guest rooms include 42-inch flat-screen high-definition televisions, coffee makers, irons, ironing boards, hair dryers and cable television. Some rooms also feature whirlpool bathtubs. Nonsmoking rooms can be requested. When would you like to stay at Comfort Inn Brooklyn? House Rules Comfort Inn Brooklyn takes special requests – add in the next step! Comfort Inn Brooklyn accepts these cards and reserves the right to temporarily hold an amount prior to arrival. Guests must be at least 21 years or older to check in. Please note, on-site parking is limited and offered on a first-come, first-served basis. Location Close to Leaving Vue night club. To approach the front desk you must walk down steps with your luggage .. Then walk back up with your luggage .. Slightly inconvenient ..
Price for this is not good at all. If I knew I didn't stay in this motel. People are luring by location but it's not fare price there. Even no safe box provided, very limited on service, very ordinary and not so clean rooms. Price for 4 nights there $1000 US is ridiculous. Not recommend this motel to anyone as you will pay much more that this worst. The only thing I didn't like is the parking wasn't big enough for a such great hotel like that. I did like the menu that the most I can say.